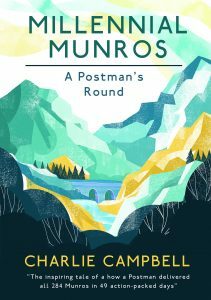 Millennial Munros is the inspirational story of an ordinary bloke doing an ordinary job, who did something extra-ordinary. With the help of his mum and some mates, he got motivated, got fit and completed an unprecedented endurance event, in breaking the world record for a continuous self-propelled round of all the Munros, Scotland’s 284 mountains over 3000 feet in height. He averaged nearly six Munros every day, and cycled or swam between them. Anyone who has done just one Munro in a day will know how big a deal this was. Charlie’s entertaining account of his adventures comes complete with maps, routes and other details to help inspire others to tackle these mountains, but perhaps in a more relaxed manner!